Dydo is ready to launch a new campaign in collaboration with Kyosho. This time, the collection of approx. 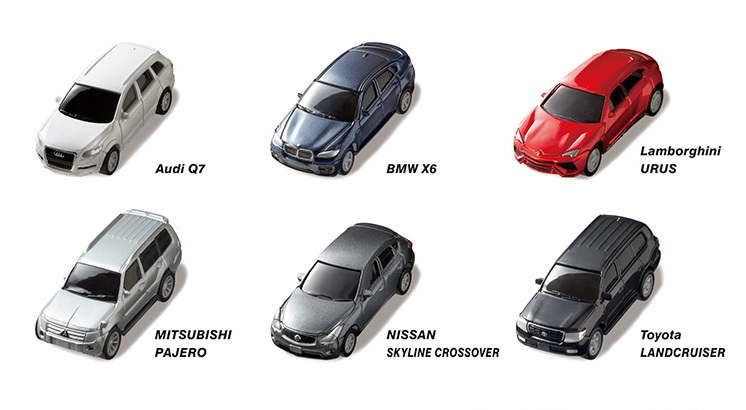 6cm long minicars will be about SUV. The line up will include the Audi Q7, BMW X6, Lamborghini Urus, Mitsubishi Pajero, Nissan Skyline Crossover and Toyota Landcruiser. 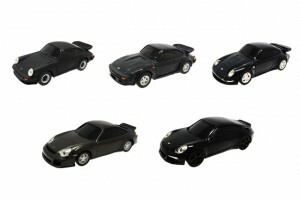 UCC Coffee, in collaboration with RUF, will release a collection of 5 models, 6cm long and all black. The line up will include the RUF SCR (911 base), RUF Slantnose (930 base), RUF THR (993 base), RUF RGT (996 base) and RUF RT35 (991 base). 829 Japan is happy to help the collectors interested in those minicars, however they are not available for a long time in stores and it is very difficult to complete a whole set a few weeks after the release. If you need one of these set, please contact 829 Japan (yannick@829japan.com) before the release date : September 16th for the Dydo SUV collection or September 30th for the UCC RUF Collection. Price for a set would be $25 (plus shipping) and does not includes the coffe cans (too heavy).